Charming home within the Montgomery Court Building located in the heart of historic Capitol Hill Neighborhood. Open floor plan. Wonderful courtyard for all residents to enjoy including a grill along with tables and chairs. Hardwood floors throughout. Very open and bright kitchen with white cabinets, tile counters and decorative back-splash along with an eating bar. Ceiling fan, All appliances. The home also features a family room, sitting area, flex room, bedroom and full bath with claw foot tub. Neutral decor. Coin-operated laundry with 3 washers & dryers and is a short walk from the property. Plenty of natural light. What a location walking distance to dining, shopping, businesses, cafes, parks & more. Matrix Spa (gym) two blocks away. Neighborhood is very friendly and safe. Gorgeous complex with so much original charm and character. 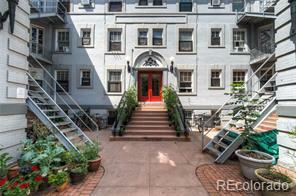 Community Features: Gated/Security, Mid Rise Building, Year Built 1908 and 43 total units.